MANILA, July 3 --- Should the Armed Forces of the Philippines (AFP) go all out, Marawi City will be flattened and the remaining Maute Group terrorists will be neutralized. 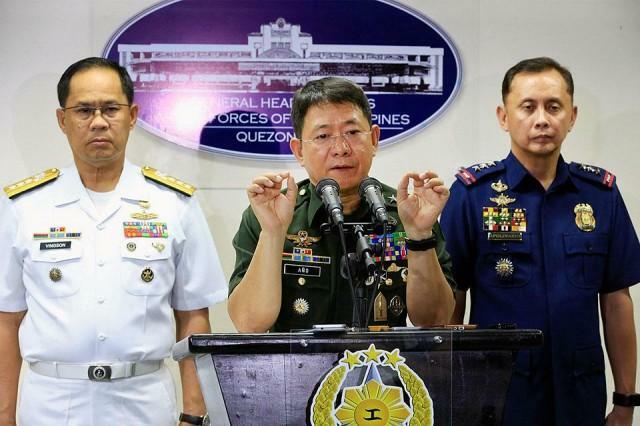 However, the military can't just do this as it is religiously following human rights and international humanitarian law when conducting operations against the lawless elements, AFP chief-of-staff Gen. Eduardo Año said Sunday. "We have an enemy who does not care how many civilians (are killed in the crossfire). Their movement has no principles to follow especially when desperate. But the AFP is following the rule of law (and human rights) so we can't just use maximum force against them," he added in Filipino. And pressing ahead, regardless of civilian losses, would mean that the AFP is no different with the terror group it is trying hard to suppress. Año also cited the case of the Japanese cities of Nagasaki and Hiroshima which were hit by US atomic bombs days before the end of World War II. He added that the destruction and massive loss of Japanese lives in the attack prompted Japan to surrender unconditionally. "We can flatten the entire city of Marawi and the battle will be over in two days but we don't want to do (as it would cause massive civilian casualties)," the AFP chief added. As of this posting, the AFP chief said that they have so far neutralized 317 bandits since fighting in Marawi City broke out last May 23. Military and police losses are placed at 82 and civilian dead are put at 44.